I’m excited to be joined today by soap artisan Lisa Chouinard who hand makes small batches of soap from her shop, Feto Soap, in Austin, Texas. We made soap last month for Mother’s Day, so when I recently learned about Feto Soap at the Maker Faire, I thought it would be fun to glean some tips from a soap master on making soap with kids! Can you tell us about your background and what led you to start Feto Soap? 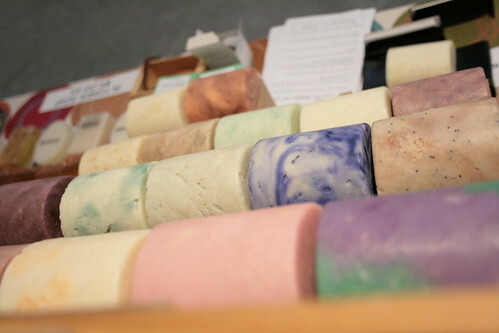 I started making soap in the summer of 2003 as a hobby while I was working at a tech support job and was posting pictures and instructions of my projects to online craft forums. Many of the people weren’t interested in making their own soap, but they liked my soap and asked if they could buy what I was making. A few months later I started Feto Soap. In the beginning my goal was to make enough money to keep in supplies (so I could keep making new things). I met and exceeded that goal a few years ago and am in the process of making new goals, defining myself and my company. Can you talk about your experimentation process and how you come up with your recipes? In the beginning I would just make soap with whatever I had on hand (I bought many different materials to work with) to see what I could come up with. When I started out what I envisioned didn’t always translate to what I was making. Here’s an example: I was trying to make a soap light purple to match the fragrance called “relaxing” and it came out blue-veined instead when I added heat and clay to it. It came out beautifully even though it was not what I had planned. 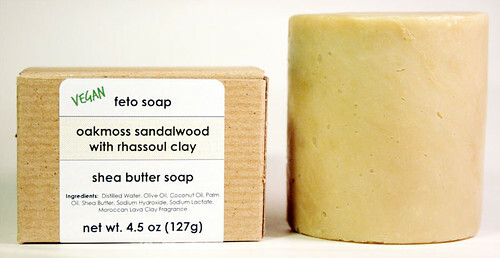 I had a naming contest for the soap and the winner received the bar they named. (Avocado Clay Spa) Now most of my ideas come out closer or exactly how I visualize them, but only because I’ve done a TON of experimentation at this point. Have there been any experiment disasters? Yes. The first few times I attempted to made soap from scratch I was impatient and inexperienced, so I didn’t get my temperatures right, resulting big caustic mess! (and no soap) Thankfully I didn’t let that stop me and I tried again and again until I got it right. 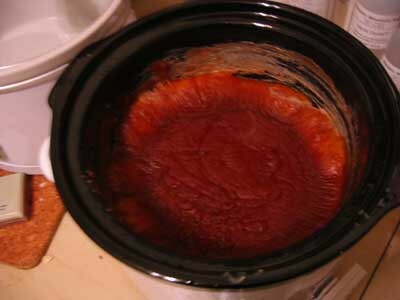 Here’s a picture of soap I mistakenly added honey too while it was cooking (resulting in “burned” soap). Some of my inspirations are food and candy. I saw lemon bars in the case at the local cafe, and the gears in my head started whirring… I have a square mold, lemon fragrance & powdered sugar… I can make Lemon Bar Soap! Another time this happened chocolate mints arrived at the end of a meal. I went home and made Chocolate Mint Soap with peppermint essential oil and added cocoa powder to my chocolate soap. You run soap-making workshops that attract a lot of kids and families. 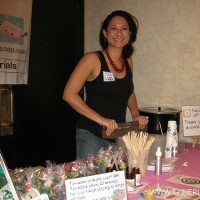 What do people seem to enjoy about soapmaking? People like making things. Melt and pour soapmaking is an easy and accessible medium. There’s no one who can’t do it, and it’s quick! You don’t have to have a practiced skill (like to be able to draw) and you can create a little piece of usable art in under an hour! 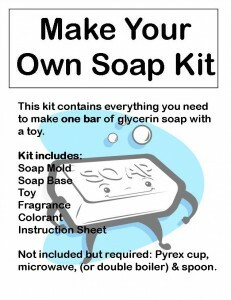 What tips do you have for those of us interested in setting up our own soap-making experiments at home or school? You don’t have to spend a lot of money on molds for soap. My first loaf mold was plastic packaging that was either going to be thrown away or recycled. When you repurpose something that wasn’t a soap mold and turn it into a soap mold, it’s called a “found mold” You can use yogurt and other plastic food containers, jello molds, candy molds – they just need to be plastic, silicone and flexible. (not metal) You can also use milk cartons. You might have to cut them away to get the soap out. After you figure out what can be a soap mold, EVERYTHING starts looking like a potential soap mold. 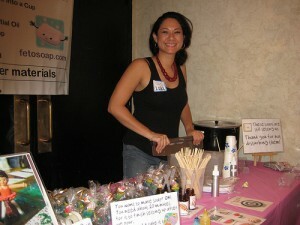 Will you share some of your soapmaking tips? Not sure how much soap will fit into your mold? Fill it up with water and pour into a graduated measuring cup. 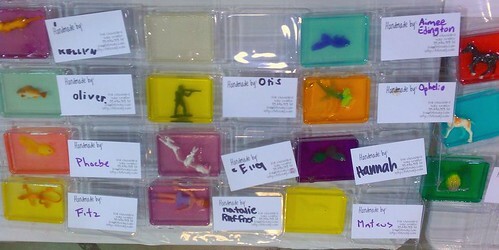 Want to get rid those pesky bubbles that came up after you poured your soap into the mold? Fill a small spray bottle up full of rubbing alcohol. Immediately after pouring the soap into the mold, spray the top once or twice to break the surface tension of the bubbles. How was your creativity encouraged in childhood? I was always surrounded by books and musical instruments, so my creativity was encouraged by reading and playing music. I day dreamt a lot and I think that was influenced by all the books I had access to read. What are you stumbling on that feels important or exciting? Soapmaking suppliers are beginning to acknowledge the need and desire for more natural products and making something called natural fragrance oils. Before, if you wanted to scent a product with something like Dreamsicle, your only choice was a fragrance oil, which was usually synthetic and not natural. I’m glad natural choices are available and am working on replacing my fragrance oils with natural alternatives when they are available. Thank you Lisa! It was fun talking with you today. Lisa is giving away $6 gift certificates (enough to buy a soap-making kit or bar of hand made soap) to three lucky readers. To enter, leave a comment by Wednesday, June 29 at 8 pm PST. Winners will be notified by email or Facebook.